If you’re reading this on Facebook, click here for the video. Video: Do you want to date my avatar? A music video promoting season three of The Guild. The Guild is a fantastic web series about a group of MMOG players. I highly recommend watching it (each episode is 5-10 minutes long, so an entire season is only about an hour of your time). The video is well produced and the lyrics are funny, though it might be a little NSFW depending on where you work. The video has sparked a small debate on whether or not it is sexist. One might just say that it was written and produced by a woman, therefore it’s not. I’ve never liked that argument. I don’t, however, think it is actually sexist. I can certainly see how it might be viewed that way [edit: just look at the still frame above] but only if taken completely at face value. One commenter at The Guild’s website objected that it was dehumanizing; as evidenced by lyrics like “You’ll never see my actual face” “You can type commands” and “She’s hotter than reality by far”. I think the commenter misses the point. The song is about dating an avatar—a digital (fake/pixelated/virtual/incomplete) representation of a real person. Of course it’s dehumanizing. An avatar is a dehumanized version of a user. And taken in connection with the web series, I think the video makes a lot more sense. The series is about a group of online friends who decide to meet in real life. And, of course, they’re nothing like their online personae (I think personas is the proper plural form of persona but Apple disagrees with me). Felicia Day (the singer in the video) is a shy recluse who is more confident and flirtatious online. The two guys who rap are nerds who play much more heroic characters in the game. The show and video are satire which revolve around stereotypes of gamers. Stereotypes which most gamers fall into, know someone personally who falls into, or can easily imagine someone they know online falling into. Maybe that’s the problem. With any instance of satire, a little background knowledge is necessary to get the joke. Imagine reading Animal Farm and having no idea the author was talking about capitalism. It wouldn’t make sense. You can’t get the point if you don’t know what they’re satirizing. In this case, it’s relationships with people that don’t exist and the divide between avatar and human being. As someone who has done a fair amount of online gaming and spent plenty of time in bulletin boards and Usenet, I find the video hilarious (both for nerdy references and the underlying meaning). But if you’ve never made friends with someone who existed to you only through a video game, I can understand how you’d miss the humour. When I bought my Mac, I thought I was condemning myself to life with absolutely no useful free programs. With Windows and Linux, I was used to being able to find in seconds a tool to do whatever it was I wanted at that moment. I seldom saw Mac software and when I did it was never free. I was wrong. Finding Mac software is still tough, but I have been extremely happy with things when I found them (except Spanning Sync). Handbrake is one of those programs. It is the greatest video conversion program I have ever used. It’s apparently also available for Windows and Linux (though I hear the Windows version is slower and buggier). I used it today to rip my Dr. Horrible DVD for my iPod. 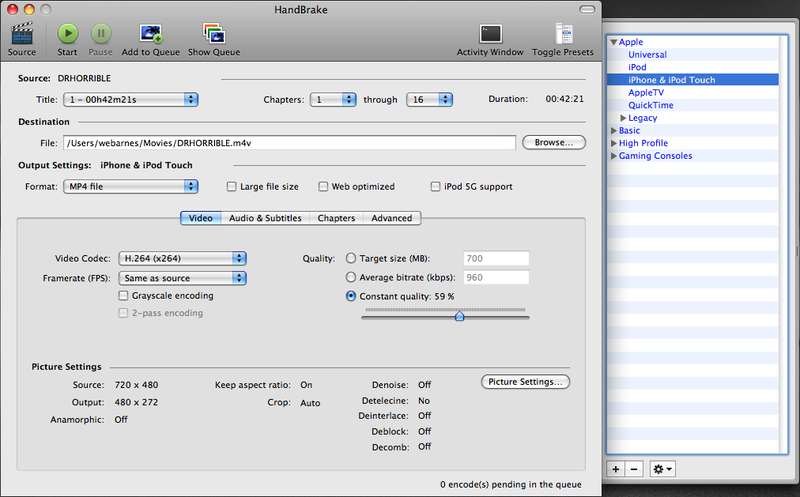 In twenty minutes (setup time + encoding time), it created an M4V file with chapters that plays perfectly on the iPod. It’s really just as simple as selecting your DVD and choosing a preset (though it has advanced options as well). I’m told it also converts just about any other type of file as well. It’s astonishingly hard to find software to do this. Sure, there are plenty of programs that claim to do it and probably a lot of them actually do, but they’re always these shifty programs from link farm-y sites. Not the sort of places I’m about to download software from. The only Windows programs I ever trusted were these clunky programs that I found back in high school. But those programs didn’t convert to any format understood by my iPod. Maybe it’s just me and everybody else already has something great to do this, but if not I hope that this is useful to somebody.